Mariano “Nonong” Araneta is pumped up for Philippine football, and it’s easy to see why. The Philippine Football Federation president has divulged exciting details of the federation’s plans to develop the national training center in the San Lazaro Leisure Park in Carmona, Cavite. Plus the Azkals are also getting ready for a busy few months ahead. 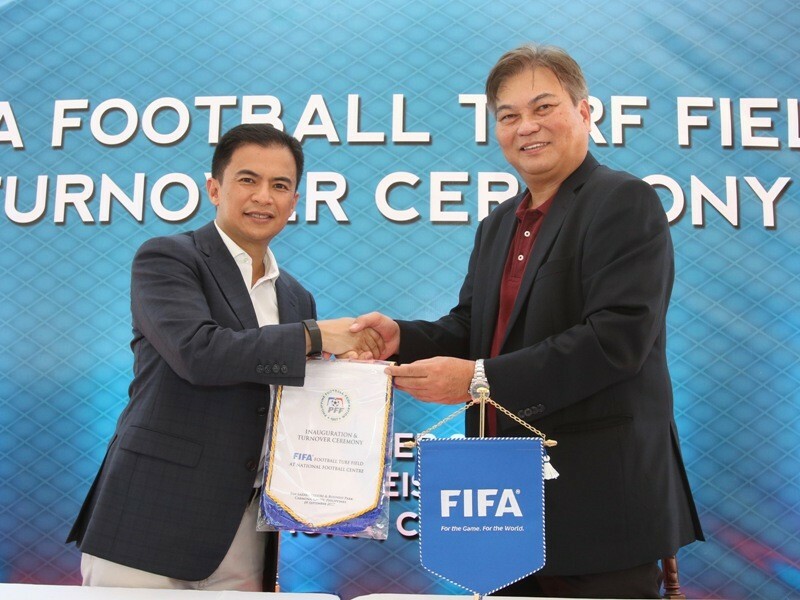 Araneta is keen on ramping up the federation’s partnership with the Manila Jockey Club in SLLP, where the FIFA Artificial Turf Pitch is situated. Already a training ground for youth national teams and club sides, Araneta says that lighting towers will soon be installed that will permit nighttime play. “We are just waiting for AFC because the lights will be bidded out,” Explains Araneta. The lights will feature an intensity of 900 lux, more than the accepted 800 lux minimum for televised matches. But that is only the tip of the iceberg when it comes to what the PFF has planned for Carmona. The PFF is planning to purchase a 3000 sqm parcel of land within the San Lazaro Leisure Park and build a complex with dormitories, classrooms for coaching and referee courses, and a gym. “The funds are ready, initially we will be getting US$1.5 Million from FIFA,” says Araneta, who says the federation will be selling their current building in Pasig to help fund the move. But Araneta says that another option is available, to buy a different 2000 sqm plot of land beside the artificial pitch that is separate from the 3000 sqm parcel. There a grandstand could be constructed, transforming the pitch into a stadium. The headquarters could then be situated under the seating while the other site houses the dorms, classrooms, and gym. More fields are also in the pipeline in the training center. Araneta says that two artificial turf mini-pitches measuring 40 by 20 meters will be made right beside the main pitch. These will also be lighted and can accommodate recreational play and festival competitions. Incredibly, there will be yet another pitch in the training center, a natural grass regulation field within the Manila Jockey Club’s racetrack. “That is for our national teams so that if they are set to play on grass, they can train there,” explains Araneta. The middle of the racetrack already has a grass area where football is played. Manila Jockey Club and PFF have yet to decide if the new grass pitch will be a brand new one or if the current surface will be improved. “We want our activities to be there,” declares Araneta. “We have already had coaching seminars there. Schools can also use our facilities. The pitch is there to be used not to be seen,” he adds with a chuckle. Araneta is a former national team player himself and is also optimistic about the near future with the Azkals. The squad is facing two big tournaments in the coming months: the AFF Suzuki Cup in November and December and their maiden appearance in the AFC Asian Cup in January 2019. Araneta says the Azkals will travel to Bahrain during the September FIFA window to play a Bahraini club side, likely on Sept 7, before tangling with the Bahrain national team on September 11. There will also be a FIFA window in October, and Araneta says the Filipinos can enjoy at least one friendly at home. Araneta hopes that Rizal Memorial will still be available before it gets spruced up in preparation for the country’s hosting of the 2019 SEA Games. “Our fans will get to watch our new team,” said the president with evident pride. Crunch time begins in November, with the Azkals in a five-team round-robin group with a new home-and-away format. The Philippines will host Singapore in Bacolod’s Panaad Stadium on November 13 before playing either Brunei or Timor Leste away four days later. The two ASEAN minnows will square off in a two-legged qualifying series in September to to determine who makes the group stage. On November 21 the Azkals entertain Thailand in Panaad in what promises to be a mouthwatering contest, before closing their group stage against Indonesia, probably in Jakarta, on November 25. The semis will run from December 1 to 6, with the two-legged finals being held on the 11th and 15th. After a quick Christmas break the team jets off to the Middle East on December 26, where final preparations for the Asian Cup will commence in earnest. There are plans to play in Qatar against either a club team or their national side, and then perhaps a game in Kuwait before the team goes to the United Arab Emirates. The group schedule is as follows: January 7 against Korea Republic in Dubai, January 11 versus China in Abu Dhabi, then January 16 against Kyrgyzstan in Dubai. The top two will advance to the knockout round, but the Philippines can also sneak through as one of the better third-placers. But the senior national team isn’t the only competition Pinoy football fans can focus on this year. The boys U15 national team were in action while the U16 girls play in an AFC competition. The U19 men also played in the AFF U19 Championship, where they beat Singapore 2-1. The senior ladies team also notched a win against the Lion City in their AFF tournament. Araneta says the very successful PFF Women’s League from last year will be run again, and that the PFF also plans a youth league. Both will be partly funded by FIFA. Of course the Philippines Football League will continue, with a League and Cup phase. The realization of these plans will be one of the achievements of Araneta’s presidency. Another will be his membership in the 33-person FIFA Council, which acts as a board of directors of the organization. Araneta was recently in Russia to watch the 2018 FIFA World Cup along with other council members. Araneta is one of six Asians in the FIFA Council, alongside members from China, Malaysia, Korea Republic, Bahrain, and Bangladesh. He is the first Filipino to serve in this level of leadership in FIFA. The Barotac Nuevo, Iloilo native freely explains the benefit the country can enjoy from this connection. He says that in the next cycle of FIFA funding he might be able to acquire an additional US$ 2 million for the development of the training center. The PFF President also enjoys the inside track when it comes to acquiring development funds from the Asian Football Confederation, since he also serves as the Chairman of the AFC Finance Committee. “All budgets pass through us. We know the funding, the revenues. We know when to ask for projects. Like the lights in Carmona, that was approved by the AFC development committee,” continues Araneta. But being part of the FIFA Council is not all glitz and glamor, confesses Araneta. He mentioned a recent Council meeting in Bogota, Colombia, that necessitated an arduous 33-hour trip through Europe for a stay that lasted just two days. Sometimes deliberations in FIFA meetings can stretch for as long as six hours. Immediately after the Bogota confab he jetted off to Kuala Lumpur, Malaysia, for another meeting. “It’s no joke,” says Araneta, who is 64 years old. But the former striker and defender has no complaints and reveals his motivation to keep on going at the job.